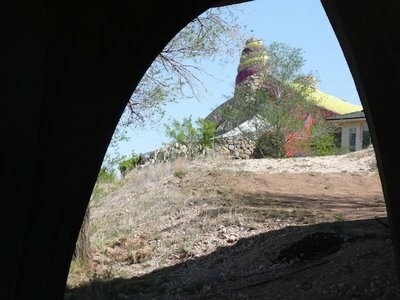 I headed to Ransom Canyon to meet the Rare Visions (RVRR) guys and renowned sculptor/architect Robert Bruno for lunch. After the guys headed on to more Texan attractions, I headed to Robert’s home known as the Metal Mansion. Woah. Another one of those “there it is!” moments. 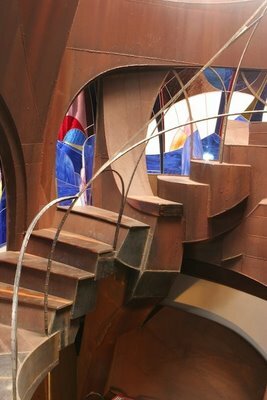 Robert began his sculptural home in 1973, with a very fluid and organic plan. 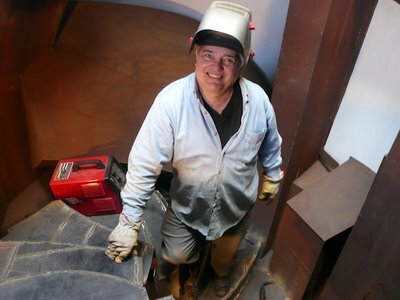 Trained as a sculpture, he moved to Lubbock from Mexico to teach at Texas Tech. A bit dismayed by the flat local landscape, he soon discovered an anomaly at Ransom Canyon. Even as you near the canyon, you can’t truly see it, as it is carved into the flat landscape. But here you will find a vista with more drama, while keeping all of the incredible vast Texan sky. This proved to be a perfect setting for his home. Over the years, the look and structure of Robert’s home has changed dramatically. Originally intended to be 1 story, he kept adding on, carving away, adjusting walls, etc. All of the walls in the home are either welded metal, or original glass/stained glass creations. All designed to optimize light and his visual experience. 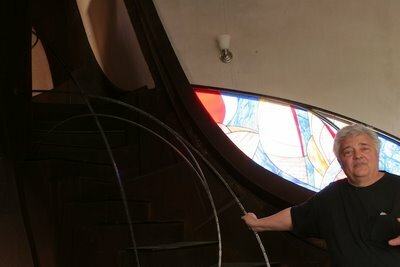 Walls were removed to increase visual vistas, stained glass added to create contrast to the rusted metal (with a subtle nod to his love of catholic iconography and visual language, as well as the old churches of Mexico). Not limited to expressions in glass and metal, Robert also created a beautiful wooden entry table of fluid lines and delicate grace. And he does it all himself, setting this home apart from a typical architectural project with other draftsmen and craftsmen contributing. (unlike another famed architect known for his fluid organic style. After 35 years of work, he just moved into his masterpiece last month. When asked what was the tipping point for the move (thinking it was something structural, mechanical, etc.) he simply said the his lease was up at his old place. I spent a way-too-short-few hours visiting with Robert, a most gracious host and kind, creative soul. Sadly, Bruno has passed away before completing his masterpiece. But today I was privileged to tour this work of art, along with hundreds of other art lovers/curiosity seekers. 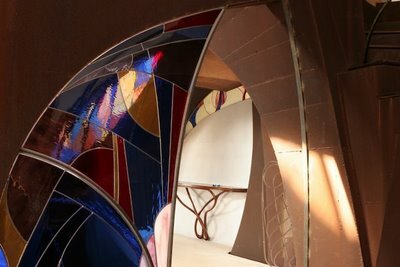 His family agreed to open the house for a one-time only public tour, as a fund raising event for the local artist society. It was amazing. I’ve been deeply in love and mesmerized by Bruno’s steel house since it first greeted me as a child in 1984. My mother had a good friend that lived in the lower part of the canyon and every time we visited I’d plead with her to navigate the maze of roads until we came upon Bruno’s beauty. A few times I witnessed Bruno welding, balanced between supernatural focus and the precarious edge of the canyon bottom below. Several years passed with multiple opportunities for us to engage with Bruno, but I never did have the courage to approach the artist. Neighbors in the canyon always seemed to be feeding the rumor mill – that Bruno came from a family with deep pockets, that he was into sacred geometry and had bizarre mathematically esoteric blueprints that factored in celestial and solar movement, that he was bankrupt and continued development was on hold, that he’d abandoned the property and left the country…he inspired so much controversy and had effectively built himself into the imaginations of the community around him. Bruno and his voluptuous muse were the sole source of palpable, vibrant energy for the whole of an otherwise sleepy community of canyon dwellers. I was away in Austin attending UT and returned home for a blink-and-you’ll-miss-it visit in the particularly brutal summer of 1998. Of course I worked an afternoon drive to LRC see what they were up to. I decided to document this particular visit, to show the home off to friends as by now I’d realized that there was no way to convey the majesty of this evolving sculpture with words (this was B.G. – before Google). I was shocked to find a now definitive entrance guarded by a locked and decorative, hand-welded gate. Despairing and burning beneath the relentless West Texas sun, I decided to steal a few moments of peace and shelter beneath her arched arms. After settling in, I realized that after nearly 15 years of knowing the home I’d never actively engaged with it in any way. Breaking the spell of passive consumption I lovingly latched onto one of the arms and took in the view of the surrounding canyon and lake below. I was there for quite some time before I felt a presence that needed to be addressed – it was, of course, Bruno inquiring as to what my intentions were, in a very concerned and protective manner as if he thought I was contemplating a canyon dive. Embarrassed, I nervously explained myself and his tension fell from his shoulders, replaced by pride that I was interested in his work and wasn’t wanting to use it as a grave marker. He was more than gracious to offer me a tour of the his life’s work. I was so taken by the stunning, visceral movement in the home I have no recollection as to what verbal exchange took place, likely nothing was said nor needed to be explained as the house speaks for itself. As a young child I vowed to one day own the steel house – attainable if the Bruno family is willing. But what aesthete would relinquish such a masterpiece?